Classic 50 metre motor yacht RS Eden has arrived at Solent Refit in Southampton, UK, for slipping and assessment before a refit. The yacht, which was launched in the 1930s and recently sold by Ocean Independence with Edmiston Company with an asking price of €6.95 million, will be assessed in order to determine the extent of the refit work that needs to be carried out. According to Solent Refit, further details about the extent of the refit work would be known after the assessment of RS Eden. RS Eden, with a length overall of 47.96 metres, was launched in 1930 and originally called Janidore. She was renowned as a state-of-the-art yacht in every respect, built by Defoe Boat & Motor Works to a design by John H Wells. Notably, back then she had a straight stem, not the clipper bow, which was fitted relatively recently, a task undertaken by her owner over the last decade to a design by Tim Saunders. The redesign also saw the yacht given an extended bridge deck and new flying bridge. Sadly, she had been in a state of disrepair after passing through many hands over her lifetime, including those of the US Navy during the Second World War. WH Bauer, who among other achievements built part of the Intracoastal Waterway in Texas, owned her during the 1960s. 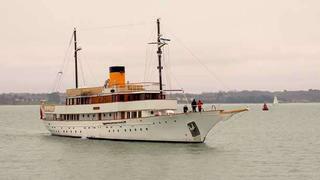 His modernisation was followed by further work in the 1990s, when she was known as Fulmara, to transform her into a charter yacht. When she was bought in 2005, there were corrosion issues in the bow area, and she spent the following two years being completely rebuilt at Neta Marine in Bodrum, Turkey, where she was given an owner's office and extended aft deck and restored to her original classic 1930s style. Solent Refit, part of the Hythe Marine Park on Southampton Water, which lies off the Solent, is an independent large yacht refit and repair facility, capable of hosting superyachts up to 90 metres in waterside and undercover facilities.